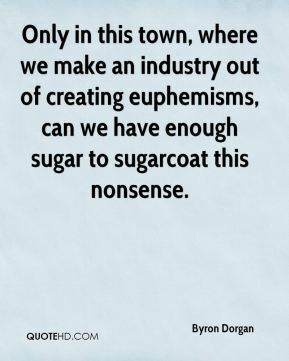 Only in this town, where we make an industry out of creating euphemisms, can we have enough sugar to sugarcoat this nonsense. 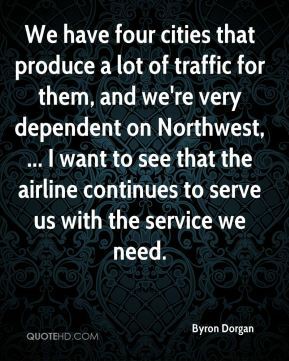 We have four cities that produce a lot of traffic for them, and we're very dependent on Northwest, ... I want to see that the airline continues to serve us with the service we need. 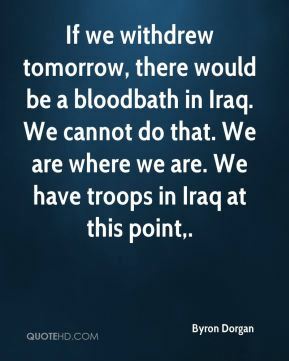 If we withdrew tomorrow, there would be a bloodbath in Iraq. We can't do that, ... Fox News Sunday. 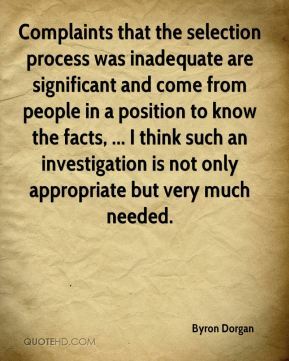 Complaints that the selection process was inadequate are significant and come from people in a position to know the facts, ... I think such an investigation is not only appropriate but very much needed. 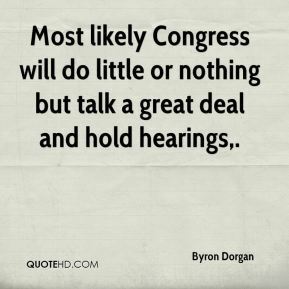 Most likely Congress will do little or nothing but talk a great deal and hold hearings. 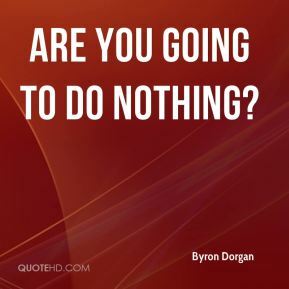 Are you going to do nothing? 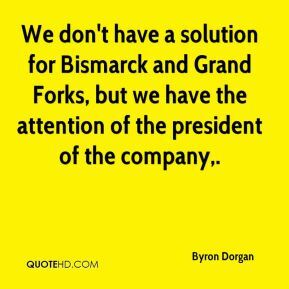 We don't have a solution for Bismarck and Grand Forks, but we have the attention of the president of the company. 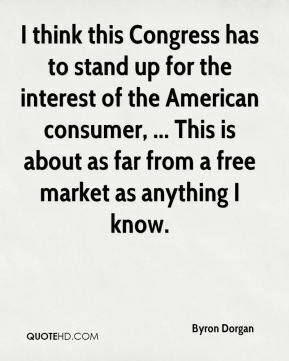 I think this Congress has to stand up for the interest of the American consumer, ... This is about as far from a free market as anything I know. 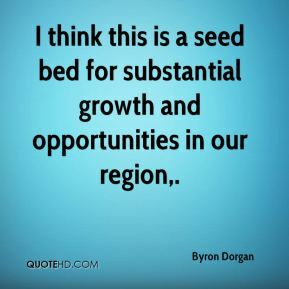 I think this is a seed bed for substantial growth and opportunities in our region. 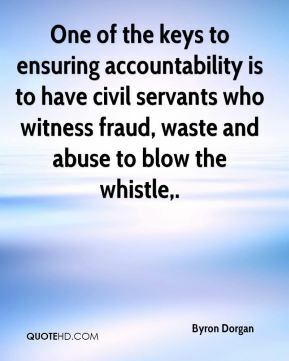 One of the keys to ensuring accountability is to have civil servants who witness fraud, waste and abuse to blow the whistle. This partnership borrowed over $110 million from a Canadian bank and that showed up booked as income to the company immediately, ... 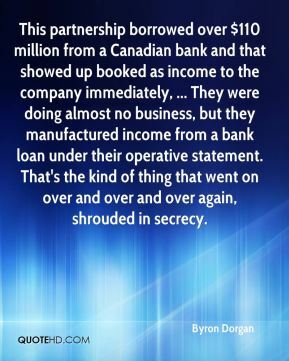 They were doing almost no business, but they manufactured income from a bank loan under their operative statement. That's the kind of thing that went on over and over and over again, shrouded in secrecy. 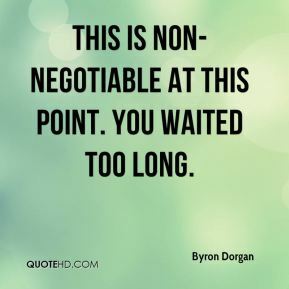 This is non-negotiable at this point. You waited too long. 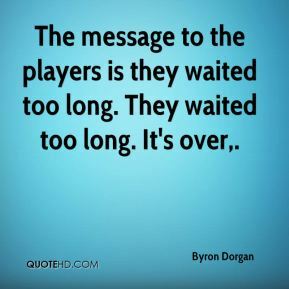 The message to the players is they waited too long. They waited too long. It's over. 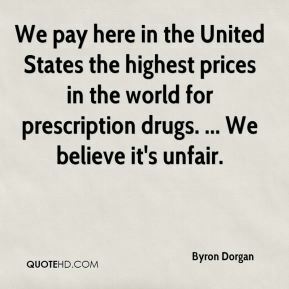 We pay here in the United States the highest prices in the world for prescription drugs. ... We believe it's unfair. 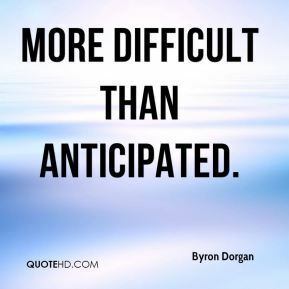 [Sen. Byron Dorgan said the move sends a strong message.] I think it's a very serious step and will be an understandable signal to the Syrians, ... 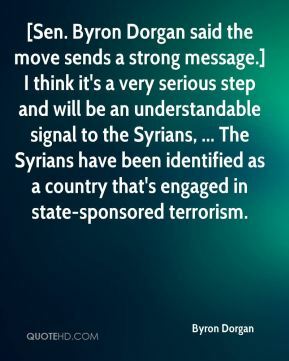 The Syrians have been identified as a country that's engaged in state-sponsored terrorism.